Thailand’s new crop of long-haul low-cost carriers have been set back by new restrictions imposed by Japan and South Korea following an ICAO determination that Thailand’s aviation authority is not in compliance with international safety standards. NokScoot and Thai AirAsia X (TAAX) will likely still be able to pursue expansion in China, which has raised new restrictions on Thai charter carriers, but Japan and Korea are critical markets for both start-ups. NokScoot has been particularly impacted as it had not yet launched scheduled services – due to a series of earlier unrelated regulatory delays – when ICAO informed Korea and Japan at the end Mar-2015 of its findings against the Thai DCA. As a result NokScoot had to shelve plans for launching scheduled services to Japan and Korea as well as cancel or hand to sister carrier Scoot charters to Japan. TAAX is in slightly better position as it was already serving two destinations in Japan and one in South Korea when both countries began imposing the new restrictions. But TAAX will have to drop a new route to a third Japanese destination and delay plans for adding capacity in both markets. This is the fourth instalment in a series of reports on the Thailand aviation market. This report looks at the outlook for long-haul low-cost carriers and the Thailand-North Asia market following restrictions recently imposed by Japanese and South Korean authorities. The next report will examine Thailand’s highly competitive domestic market and the outlook for Thailand’s short-haul LCC sector. The first report analysed the outlook for Thai Airways' full-service regional subsidiary Thai Smile, including its potential role in the restructuring at its parent. The second report looked at the outlook for Bangkok Airways as expansion at its airport on the popular tourist island of Samui is pursued. The third report focused on the fleet and network restructuring at Thai Airways. ICAO recently reported Significant Safety Concerns (SSC) with the Thai Department of Civil Aviation (DCA) that were uncovered during a Jan-2015 audit. Such determinations by the ICAO Universal Safety Oversight Audit Programme (USOAP) automatically trigger restrictions on airlines registered in the concerned country from some ICAO members. The restrictions vary depending on the authority and many authorities do not issue any restrictions but instead step up inspections of the airlines which operate from the concerned country. The latter is a fairer and more sensible approach as it does not penalise airlines that are licensed by authorities which to no fault of its own are not meeting international standards. The increased inspections ensure the airlines themselves are meeting international safety standards, even if their governments do not have adequate oversight. Restricting expansion inevitably impacts consumers particularly as most expansion in Asia these days comes from LCCs, which drive down fares and stimulate demand as they enter new routes. None of the Southeast Asian countries have policies restricting growth from airlines licensed by countries which fail to meet ICAO standards. As a result the recent findings against Thailand have no impact on Thailand’s regional short-haul market. But Thailand’s medium-haul market, which was expected to see rapid growth in 2015 due primarily to expansion at the country’s two new medium/long-haul LCCs, is impacted as some North Asian countries do have such policies. Thailand’s long-haul market may also be impacted as the EU and US have their own set of restrictions which are issued after they make their own assessments. Such assessments almost always are the same as the assessments of ICAO but there is typically a lag of a few weeks or sometimes months before they are published. South Korea and Japan allows airlines that are already serving their countries to maintain existing services. Japan typically has a strict restriction on all additional flights from existing carriers including charters although has provided a one-off authorisation for some charters from Thai carriers for the upcoming Songkran holiday (Thai New Year) period, which this year falls in mid April. South Korea typically has been slightly looser in allowing some additional flights from authorised carriers but has always strictly blocked airlines that are not yet serving the country. The restrictions imposed by Japanese and South Korean authorities in the event of another country failing an ICAO audit almost always benefits legacy operators. For example Philippine LCCs were blocked from expanding in Korea and Japan for several years until the Philippines was able to pass an ICAO audit in early 2014. This resulted in a lower than average LCC penetration rate and stunted growth, particularly in the Philippines-Japan market. The Thailand-Japan and Thailand-Korea market will similarly be impacted by the newly imposed restrictions. The incumbent carriers will benefit as new Thai LCCs are unable to implement expansion plans. Consumers will be impacted as capacity growth may not be able to keep up with demand. Thailand-Japan is a particularly hot market as Japan’s new visa waiver policy and depreciation of the yen has led to a surge in Thai visitors to Japan. Thailand-Japan has traditionally been primarily an inbound market. Thailand remains a popular holiday destination for the Japanese but over the last year the market has become more balanced as outbound traffic has seen very rapid growth. 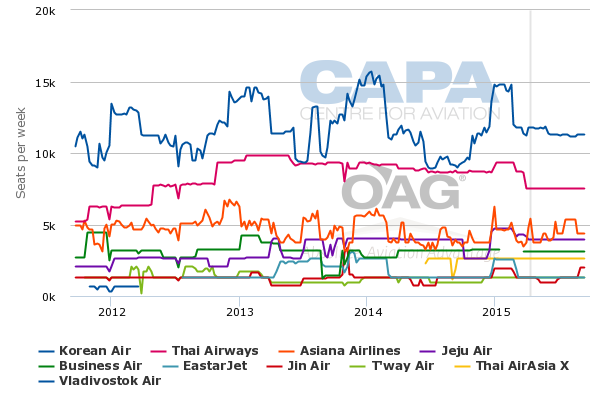 Thai Airways is the largest incumbent in the Thailand-Japan and currently accounts for a 52% share of scheduled seat capacity between the two countries, according to CAPA and OAG data. Total seat capacity is up about 13% in the Thailand-Japan market compared to Apr-2014 with TAAX accounting for virtually all of the growth over the last year. TAAX has already surpassed All Nippon Airways (ANA) and Japan Airlines (JAL) to become the second largest carrier in the Japan-Thailand market. 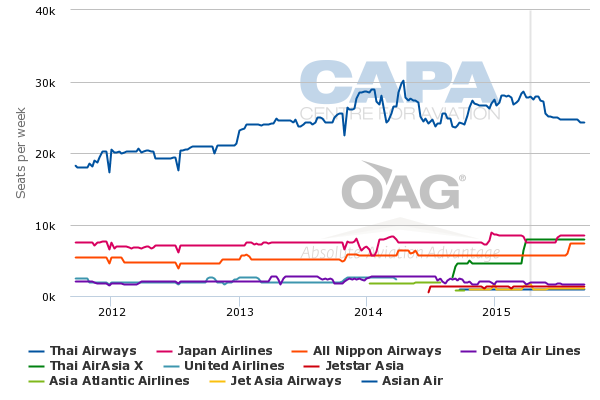 ANA currently has almost an 11% share of capacity and JAL about 14% while TAAX has almost 15%. But ANA will be able to close the gap with TAAX due to the new restriction blocking further expansion by Thai carriers. ANA is adding a fourth daily flight to Bangkok in late Jul-2014, which will give it almost as much capacity in the Thai market as TAAX and JAL. ANA decided to add the extra flight several months before the restrictions on Thai carriers were implemented. But the new restrictions should improve the initial performance of the additional flight, which will give ANA a total of four flights from Thailand (including two daily flights on Bangkok-Tokyo Narita and two daily flights on Bangkok-Tokyo Haneda). The new restrictions could also potentially persuade ANA to add more capacity to Thailand. JAL could also consider adding capacity to Thailand. JAL already has four daily flights from Bangkok with one daily flight each to four Japanese hubs – Nagoya, Osaka Kansai, Tokyo Haneda and Tokyo Narita. But Japanese carriers are typically not aggressive to responding to such opportunities, particularly as the restrictions on Thai carriers could be relatively temporary as the Thai DCA is now working on raising its standards in the hopes of passing a new ICAO audit within the next year. Most likely Japanese carriers will maintain their capacity to Thailand and focus on improving yields and load factors. The suspension of expansion by its LCC competitors should help Thai improve its performance in Japan, which is its largest single market accounting for about 14% of its international seats and 16% of its international ASKs. Thai has had to cancel some seasonal charter flights to Japan but the impact of such expansion is negligible and more than offset by the benefits that will come as competition against other Thai carriers is reduced. South Korea is also an important market for Thai Airways but not nearly as much as Japan. South Korea accounts for only about 3% of Thai’s international seats. Thai Airways is also not the market leader in the Thailand-South Korea market. 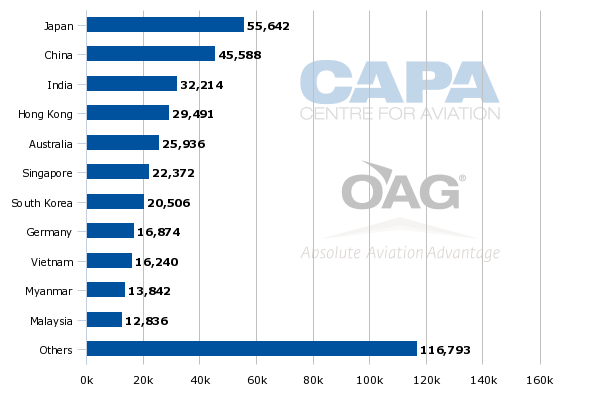 Korean Air is the leader in the Thailand-South Korea market with a 32% share of current seat capacity, according to CAPA and OAG data. Thai is the second largest carrier in the Thailand-South Korea market with about a 20% share while Asiana is the third largest with about a 13% share. There are currently about 38,000 weekly one-way seats from Thailand to South Korea, an increase of approximately 2% compared to Apr-2014. Four Korean LCCs also serve the Thailand-Korea market, accounting for a 21% share of seat capacity collectively. No Japanese LCC currently serves the Thailand-Japan market and opportunities for Japanese LCCs are limited as Japan is generally not in narrowbody range of Thailand (except for southern Japan) while all of Korea is within narrowobody range of Bangkok. Korean LCCs could potentially take advantage of the restrictions facing their Thai counterparts and add capacity to Thailand. Jeju Air is the largest LCC in the Thailand-Korea market as it operates three daily flights to Bangkok compared to one flight for the other three Korean LCCs (Eaststar Jet, Jin Air and T’way Air). TAAX currently has about a 7% share of seat capacity in the Thailand-Korea market, which makes it the sixth largest player after Korean Air, Thai Airways, Asiana, Jeju Air and Thai leisure carrier Business Air. TAAX currently operates one daily flight to Seoul, which it launched in Jun-2014 and was the carrier’s first scheduled route. TAAX subsequently added scheduled services to Japan in Sep-2014 although for several months it operated charters to Japan as it waited for approval from Japanese authorities for scheduled services. TAAX currently operates three daily flights to Japan, including two daily flights to Tokyo Narita and one daily flight to Osaka. TAAX is fortunate in that it added a second daily Narita flight at the end of Mar-2015 and upgraded Osaka from five to seven weekly flights. If these additions had come slightly later they would have been blocked as part of the new restrictions imposed by Japanese authorities. The additional capacity to Tokyo and Osaka was made possible as TAAX took its third A330-300. TAAX is planning to add four more A330s by the end of 2015, giving it a year-end total of seven aircraft. But the AirAsia X Group may need to relook at aircraft allocations for the remainder of 2015 as TAAX was planning to use some of the four additional aircraft to pursue further expansion in Japan, starting with a new daily service to Sapporo, and potentially South Korea. TAAX is still able to launch Sapporo on 1-May-2015, which is made possible by the upcoming delivery of its fifth aircraft. The impact on new routes which were already approved but not yet launched is somewhat of a grey area. But TAAX has stated that it will only be able to operate Sapporo until the end of Jun-2015. TAAX explained that it had only had secured approval from Japanese authority for the initial two months when the restrictions were implemented and that it is issuing refunds to passengers that were booked on Sapporo flights for 2H2015. TAAX will also be unable to launch any other new route to Japan or add more capacity to Tokyo or Osaka until the newly implemented restrictions are eased. It has not yet announced any new route for Jul-2015 which will be needed to replace the Sapporo service. TAAX also has not yet announced routes for its sixth or seventh aircraft. But TAAX has stated that it is aiming to launch services to secondary cities in China. Clearly TAAX will need to quickly pursue expansion in new markets. Korea and Japan are important markets for TAAX and are the only countries currently served by the carrier. The situation at NokScoot is more drastic as the airline had not yet launched scheduled services to Japan or South Korea when the restrictions were implemented at the end of Mar-2015. NokScoot secured its operators’ certificate from Thai authorities in Oct-2014 and was initially aiming to launch services to Japan by early 2015, followed soon after by South Korea. But as CAPA previously reported NokScoot encountered several regulatory delays, particularly with Japanese authorities, forcing it to push back the launch of scheduled service several times. In 1Q2015 it was only able to complete a limited number of charter flights to Japan despite having a fleet of two 777-200s for the entire quarter. NokScoot finally commenced sales on 10-Mar-2015 for scheduled flights beginning May-2015 to Seoul and Nanjing in China. At the time it was also optimistic it would be able to begin scheduled services to Japan in May-2015 but never began sales. NokScoot also has had to halt charters to Japan and will need to wait for Thailand’s DCA to pass a new ICAO audit before it can relook at plans for launching scheduled services to Japan. The inability to serve both Korea and Japan is a huge blow for NokScoot as these are the two main markets in the joint venture’s business plan. NokScoot has responded to the setback by delaying the delivery of its third aircraft, a 777-200 which was previously operated by Singapore-based sister carrier Scoot. This aircraft is now being temporarily retained by Scoot, which is using it to take over charter flights from Bangkok to Tokyo which NokScoot which originally was committed to operating. NokScoot also has had to cancel several charter flights to Japan, including to Osaka and Sapporo, which Scoot was unable to accommodate. Scoot could also potentially launch scheduled services from Bangkok to Japan using fifth freedom rights that are available in the Thailand-Japan market to Singaporean carriers. This would be a logical option for the Scoot group as it would provide an alternative for the Scoot brand to enter the Thailand-Japan market without having to wait for Thailand to pass an ICAO audit. Thailand-Japan is a strategically important market for NokScoot and the Scoot group. The Scoot group needs to close the gap with the rival AirAsia X Group, which already operates three daily flights to Japan. Fifth freedom flights from Bangkok to Tokyo and potentially Osaka would also allow Scoot to retain the 777 which was originally slated to be delivered to NokScoot by Apr-2015. This in turn would allow NokScoot to keep its fleet at a more manageable two aircraft. Extremely low aircraft utilisation rates have already impacted NokScoot during its extremely difficult start-up phase. Having to take the third aircraft would exacerbate the situation, leading to even steeper losses. But having to keep the 777 for more than a few months is not an ideal scenario for Scoot as Scoot was planning to transition to an all-787 fleet in mid-2015. One option would be for Scoot to temporarily use one of its growth 787s to cover Bangkok-Japan flights. Scoot has not yet announced any new routes from Singapore for 3Q2015, which should give it the flexibility to base one of its new 787s in Bangkok. The setbacks in Korea and Japan mean NokScoot will have to rely entirely on the China market for at least the next several months. For now it has stopped selling flights to Seoul through Oct-2015 but it could be several more months before Korea lifts restrictions on Thai carriers. China has never moved to block airlines from countries which fail an ICAO audit. Media reports in early Apr-2015 that said China was following Japan and South Korea in placing new restrictions on Thai carriers were not correct. But China has been implementing new more restrictive measures against foreign carriers, particularly charter carriers. This is not related to the ICAO audit in Thailand or other countries but has impacted some Thai carriers as well as charter carriers or start-ups in other Southeast Asian countries including Cambodia. China has recently rejected several requests for additional charter flights from Thai airlines. But this is in response to a concern over the operation of specific airlines. China has not blocked expansion from any scheduled carrier. The two main Thai carriers operating scheduled flights to China, Thai Airways and Thai AirAsia, are not likely to face any restrictions by Chinese authorities. The NokScoot case is slightly different as NokScoot has not yet launched services to China or operated any scheduled flights on any route. Over the last year China has begun requiring new airlines to complete a certain number of months (typically six) of operations and a certain number of flights (at least 100; in some cases more) before being approved to operate into China. NokScoot’s inability to operate charters to Japan in the lead-up to its planned launch of scheduled services to China could potentially impact its ability to meet this requirement. But China could potentially authorise NokScoot without enforcing the requirement as it has not been universally applied. NokScoot could also potentially take on charter contracts to countries other than South Korea and Japan. NokScoot has delayed the planned launch of thrice weekly services to Nanjing from 5-May-2015 to 2-Jun-2015. No reason for the delay has been provided but it could potentially give NokScoot enough time to operate enough charter flights to other countries to meet the Chinese requirement. NokScoot and TAAX are not alone in being impacted by the ICAO SSC finding for Thailand. Smaller charter and leisure carriers in some cases are even more impacted as they rely primarily on charters to China, Japan and South Korea. The inability of these carriers to continue securing approvals for charter flights from Japanese, South Korean and in some cases Chinese authorities benefits the existing scheduled operators. There are also several planned start-up airlines in Thailand that were primarily targeting charter opportunities in the fast-growing North Asian market. Thailand DCA has halted the processing of these applications as it focuses on addressing the deficiencies raised by ICAO, providing yet another benefit for the incumbents. Thailand’s DCA is right to focus on beefing up oversight of its existing carriers. It has allowed too many start-ups to launch in recent years while not expanding its resources. There are now over 40 locally licensed airlines under the Thai DCA. ICAO’s SSC finding is a reflection more than anything else of Thailand’s inability to oversee such a large group of airlines. Thailand is now investing significantly in enhancing its aviation oversight capabilities as part of action plan in response to the SSC finding. It is also establishing a new separate regulator for aviation and a new airport authority, which will take over operation of Thailand’s regional airports from the DCA. While publicly Airports of Thailand operates most of Thailand’s medium and large size airports the DCA still operates over 20 smaller regional airports, a set-up that fails to meet ICAO standards. The new response of the Thai government is encouraging. But it will still take several months for Thailand to comply again with ICAO standards. In the meantime Thailand’s airline sector, in particular the two long-haul LCCs, will have to make do with unfortunate restrictions imposed by Japan and South Korea. Such restrictions are arguably inappropriate and have a negative economic impact, in particular on the tourism and travel sectors. In particular in the case of the major JVs, such as Thai AirAsia X and NokScoot, the restrictions have little logic; these are both airlines that have parentage only partly reliant on Thai regulatory oversight. They have an evolving and unique overlap with regulation in their other jurisdictions and their group nature means that there is in many ways even more intense scrutiny than airlines with a single jurisdictional origin.